On that DNA Thursday I will be making two presentations and taking part in another event. Was Henderson Dowell's Father of African or European Descent? Get acquainted with the authors of recent DNA books. Learn what is covered in each book. Friday I get to go from presenter mode to learner mode in an all morning workshop. This workshop will review ways in which autosomal DNA can be mapped so that DNA segments may be attributed to individual ancestors. Participants will be shown how to begin or continue the process of mapping their DNA. In addition, techniques for phasing their DNA will be demonstrated. Level: Adv. (Tim P. Janzen, MD) Participants need to bring laptops to the workshop loaded with Excel or other spreadsheet program. Later Friday I get back on the other side of the mike for a panel discussion. 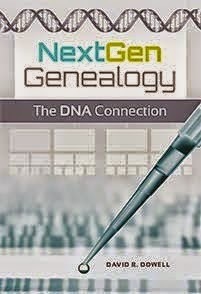 DNA testing experts will discuss the connection between DNA testing and genealogy, what tests are available, and which companies provide which tests. Advances being made in the field of Genetic Genealogy will be examined. Audience questions will be answered in the second half of the program. While I am conferring, Denise will be visiting her sister and brother who live nearby. Also on Friday our non-biological grandson, Cameron Adams, will be graduating from San Luis Obispo High School. He also happens to be my 10th cousin -- twice removed. We will also help him celebrate his birthday on Sunday. On Monday, in what is becoming an annual tradition, we will meet a group of our former neighbors and friends for lunch at the Great American Fish Company at the T-pier in Morro Bay where the sea otters have been in great abundance this Spring. Tuesday we plan to have a late lunch with two newly discovered 4th cousins. One of them is a former colleague I have known for years but had no idea we were related until last Fall. The other will be flying in from Texas for the occasion. They are half-sisters who met for the first time in November. For their story see here. The following morning we will fly back to Nashville exhausted but with many memories to cherish.